If you've been keeping an eye on the Waitrose green tokens for local charities recently you may have spotted one of the slots raising funds for the restoration Shadbolt Park Pond (there is a map is at the bottom of this blog post, if you're not familiar with where Shadbolt Park is). 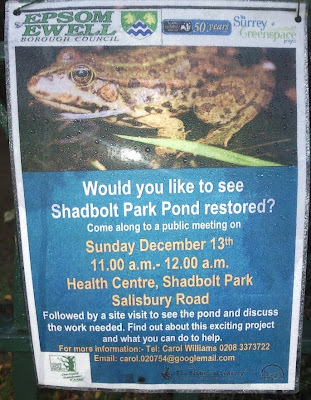 Blog reader Andrew B (not to be confused with the other Andrew B who supplied Wednesday's rat story) has alerted me to the fact that a Public Meeting about the proposed restoration of the pond will be taking place at 11am this coming Sunday (13th December) at the Health Centre in Shadbolt Park (Salisbury Road). Full details are on the photo of the notice below, which Andrew also kindly sent in.